As part of the ATS Design Group, Albee Digital provides professional solutions for web design, E-commerce, email marketing and social media integration. Our friendly, efficient approach along with visionary ideas, are implemented with you, our customer and your needs in mind. If you are looking for a Cedar Rapids web design companythat can do what they promises then we are the company you need to speak with. Mobile marketing is here to stay. 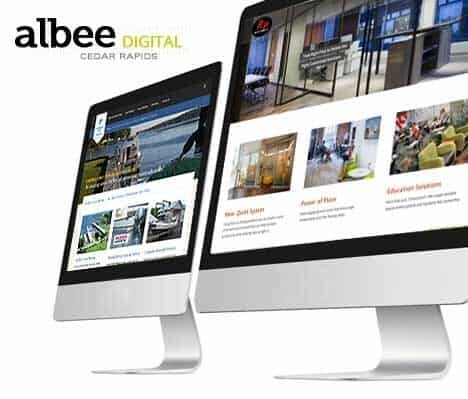 And for businesses throughout Cedar Rapids andEastern Iowa, Albee Digital can provide you with a great, fast-loading, mobile-friendly website design to help you promote your goods and services on mobile devices such as smartphones and tables, right where you’re customers and prospects live. We custom design mobile-friendly websites that load fast and are easy to read on smartphones and mobile devices. And since Cedar Rapids and Eastern Iowacustomers use their smartphones as their go-to reference tool, we can help you realize your mobile marketing goals to reach prospects and customers when they’re most ready to engage with your company and seek your services. If you have a particular design or if you’re starting from a clean slate, we can work with you to develop a website that not only works but also looks great. As a bonus we also include free expert friendly advice. Looking to show and sell your products online then E-Commerce is the perfect way and saves you a ton of money on printed material. E-Commerce is the absolute most effective solutions to get your products online! If potential customers are not inquiring through your website then you need Search Engine Optimization services. With our expertise we can make sure your website is found online. WE’RE HERE TO HELP! If you’ve got a website project that you want to clearly communicate your message and turn visitors into clients, let’s talk. Our offices are open Monday through Friday, but our Email never closes.